The real blessing of the Ride for the Unborn is the opportunity that we have to support pregnancy resource centers throughout the Commonwealth of Virginia. Each year, we designate a different resource center as the beneficiary of the ride. Even though we make that designation, we strongly encourage you to support your local resource centers that are in such desperate need of financial resources, in-kind gifts and volunteers. If you have a heart for the unborn and desire to show compassion to those in a time of crisis, please reach out to your local center. They would love to hear from you! If you need information about centers in your area, feel free to reach out to us. It would be our honor to connect you with the wonderful folks serving your community. 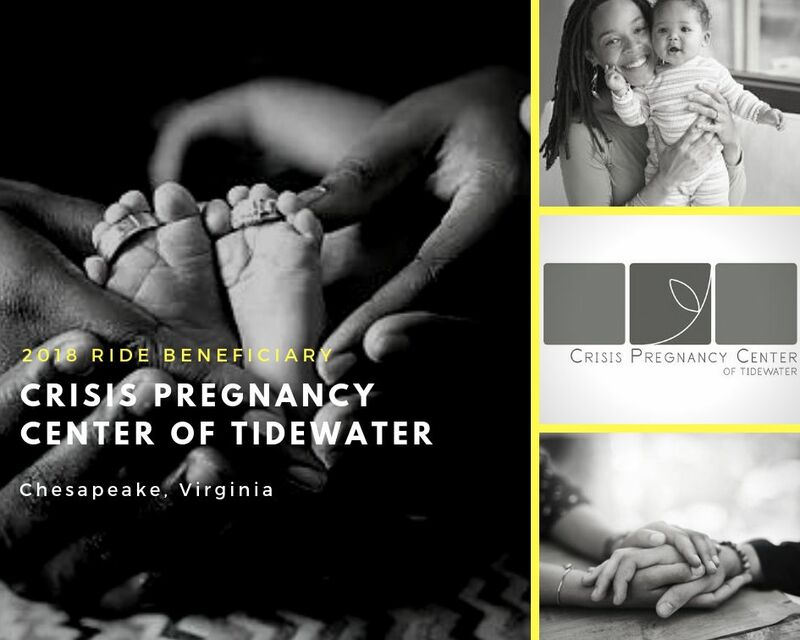 The beneficiary of the Ride for the Unborn in 2018 is Crisis Pregnancy Center of Tidewater (CPC) in Chesapeake. ​CPC is a Christ-centered organization with a calling to reach out to women and families involved in crisis-related pregnancies by offering real help for the present, hope for the future, and healing from the past. CPC exists to save lives, spare hearts and further the gospel of Jesus Christ. They want their clients to know they genuinely care and have no financial gain from their pregnancy decision. They raise all financial support for their ministry through private funding. CPC goes head-to-head daily with abortion facilities seeking to prey upon those facing a time of crisis and uncertainty. Tragically, for every three babies born in the Hampton Roads area, one will lose its life to abortion. More lives are lost to abortion than any other cause of death. Each day, the CPC staff and volunteers interact with women and their families who are struggling with a new pregnancy and considering their options. They seek to come along side each woman and affirm her value and the value of the child she is carrying. Their desire is to see every woman choose life for her baby, and to provide the emotional and spiritual support she so desperately needs. The Ride for the Unborn is so thankful for this outreach in our commonwealth. It is our honor to bring attention to this wonderful ministry so worthy of support. Together, we will leave no doubt that Virginia Stands for Life!